There are 6 Assisted Living Facilities in the Baldwinsville area, with 2 in Baldwinsville and 4 nearby. The average cost of assisted living in Baldwinsville is $4,200 per month. This is higher than the national median of $3,346. Cheaper nearby regions include Liverpool with an average starting cost of $3,132. To help you with your search, browse the 60 reviews below for assisted living facilities in Baldwinsville. On average, consumers rate assisted living in Baldwinsville 4.4 out of 5 stars. Better rated regions include Oswego with an average rating of 4.5 out of 5 stars. Caring.com has helped thousands of families find high-quality senior care. To speak with one of our Family Advisors about assisted living options and costs in Baldwinsville, call (855) 863-8283. Baldwinsville is part of the Syracuse metropolitan area and is located in Onondaga County. The area is home to the beautiful Onondaga Lake and Onondaga Lake Park. More than 23 percent of Baldwinsville's nearly 8,000 residents are over 65 years old. There are two assisted living residences located in Baldwinsville. Another 13 are located nearby in areas such as Liverpool, Syracuse and Camillus. The Baldwinsville area is an affordable choice for seniors on a budget, with a cost of living that's 7.6 percent below the national average. Winters in Baldwinsville are extremely snowy and cold. The area has an average low temperature in January of only 15 degrees and gets an average of 80 inches of snow each year, which is well above the national average of 26 inches. Seniors who enjoy spending time outdoors may see this as a deterrent to living in the area. Seniors with respiratory illnesses living in the area don't need to worry about the air quality, as it's been given a passing grade by the American Lung Association. Baldwinsville's violent crime rates are extremely low, meaning that seniors living in the area can feel safe leaving their home. A total of 0.13 violent crimes per 1,000 residents happens on average each year in Baldwinsville, while the state average in New York is much higher at 3.76 per 1,000 residents. The Baldwinsville area is home to world-class medical facilities, including St. Joseph's Hospital, in the event of medical emergencies or illness. The Baldwinsville area has plenty of arts and culture for local seniors to enjoy. Some assisted living residences may offer supervised day trips to some of the area's top attractions, including the Rosamond Gifford Zoo or the Erie Canal Museum. Assisted Living costs in Baldwinsville start around $4,200 per month on average, while the nationwide average cost of assisted living is $4,000 per month, according to the latest figures from Genworth’s Cost of Care Survey. It’s important to note that assisted living rates in Baldwinsville and the surrounding suburbs can vary widely based on factors such as location, the level of care needed, apartment size and the types of amenities offered at each community. New York's Medicaid State Plan is available to seniors in the Baldwinsville area's assisted living residences. The state's Long-Term Home Health Program 1915(c) Waiver helps cover the cost of services for assisted living for eligible seniors. 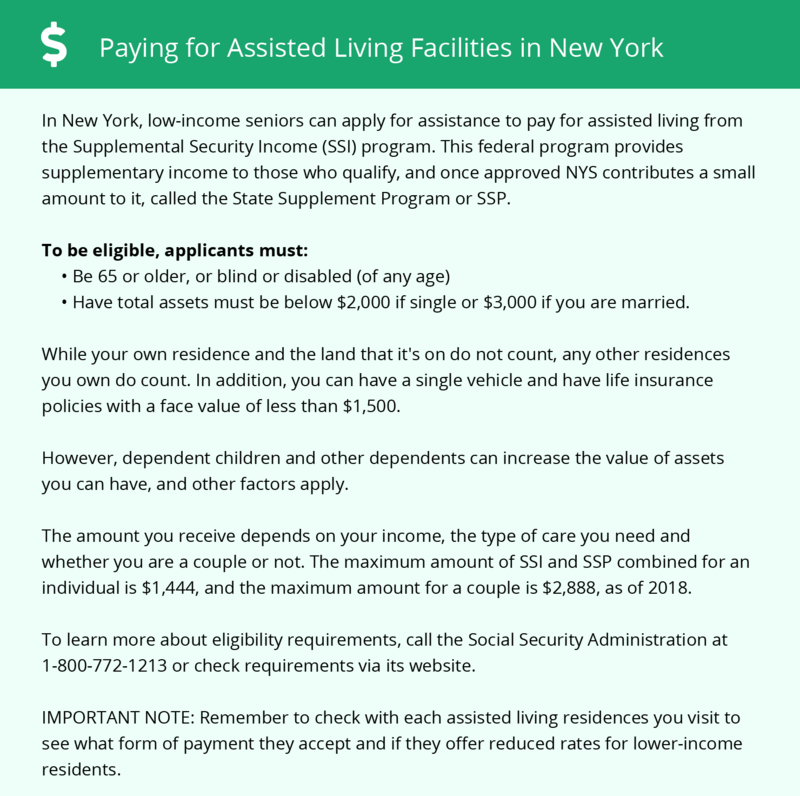 An optional state supplement is offered to seniors who live in assisted living residences in New York. The amount varies based on the level of care provided to the resident. Family supplementation is not permitted in New York. Baldwinsville and the surrounding area are home to numerous government agencies and non-profit organizations offering help for seniors searching for or currently residing in an assisted living community. These organizations can also provide assistance in a number of other eldercare services such as geriatric care management, elder law advice, estate planning, finding home care and health and wellness programs. To see a list of free assisted living resources in Baldwinsville, please visit our Assisted Living in New York page. Baldwinsville-area assisted living communities must adhere to the comprehensive set of state laws and regulations that all assisted living communities in New York are required to follow. Visit our Assisted Living in New York page for more information about these laws.